'U.S. 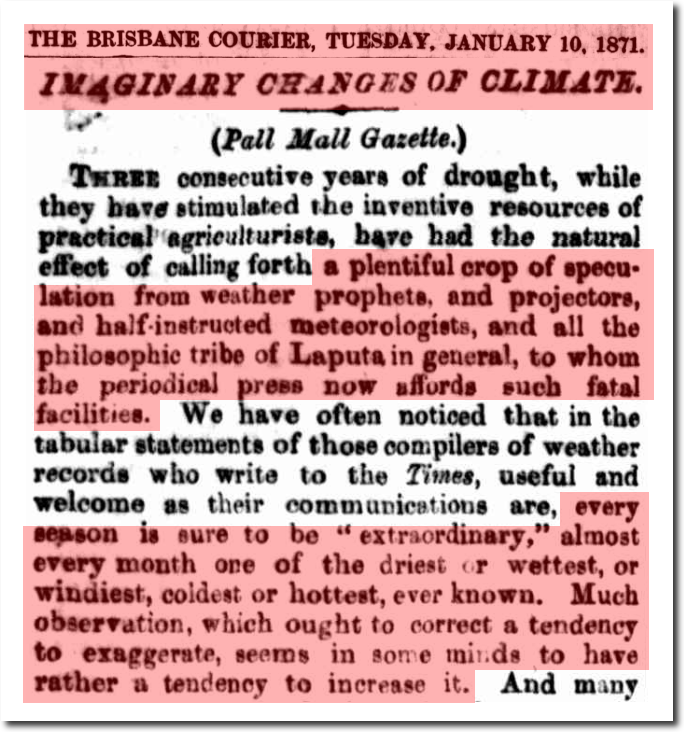 Data Since 1895 Fail To Show Warming Trend' – NYTimes.com - Also that year, NOAA said most global warming occurred before 1919, Earth cooled from 1921 to 1979, and there is “considerable uncertainty among scientific experts” -- “In spite of all the well-publicized concern about global warming, you must understand that there is still considerable uncertainty among scientific experts about a number of critical factors which determine global warming,” NOAA administrator John Knauss said in a statement issued for the geophysics meeting. 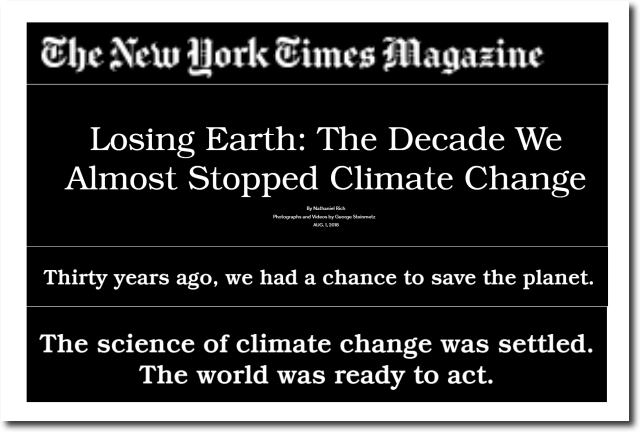 In today’s New York Times today, they say global warming was settled science thirty years ago, the world was ready to act, and that we could have saved the planet. Analysis of warming since 1881 shows most of the increase in global temperature happened before 1919 — before the more re-cent sharp rise in the amount of carbon dioxide in the atmosphere. said Thomas Karl, of the National Oceanic and Atmospheric Administrations National Climatic Data Center in Asheville, N.C. 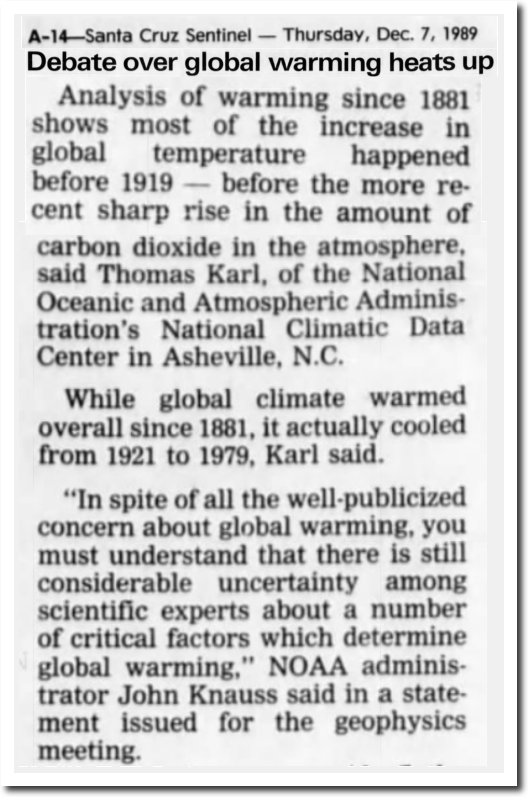 While global climate warmed overall since 1881, it actually cooled from 1921 to 1979, Karl said. “In spite of all the well-publicized concern about global warming, you must understand that there is still considerable uncertainty among scientific experts about a number of critical factors which determine global warming,” NOAA administrator John Knauss said in a statement issued for the geophysics meeting. 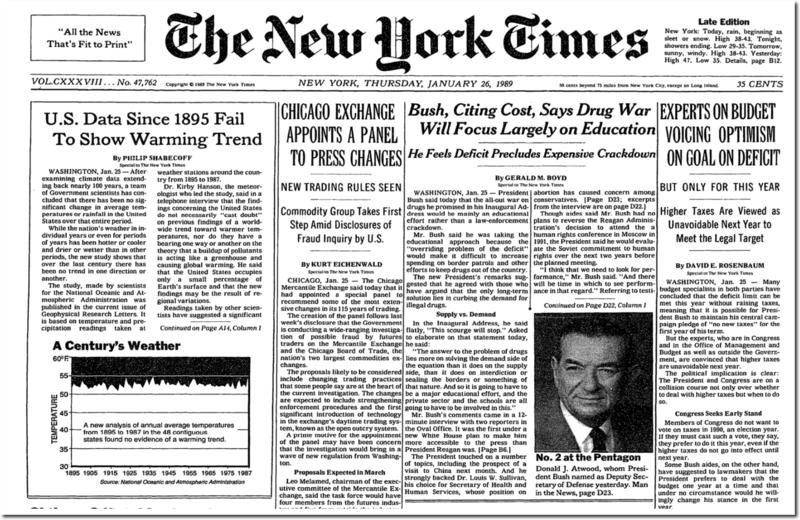 Ten years earlier the New York Times said there is no end in sight to the thirty-year cooling trend. 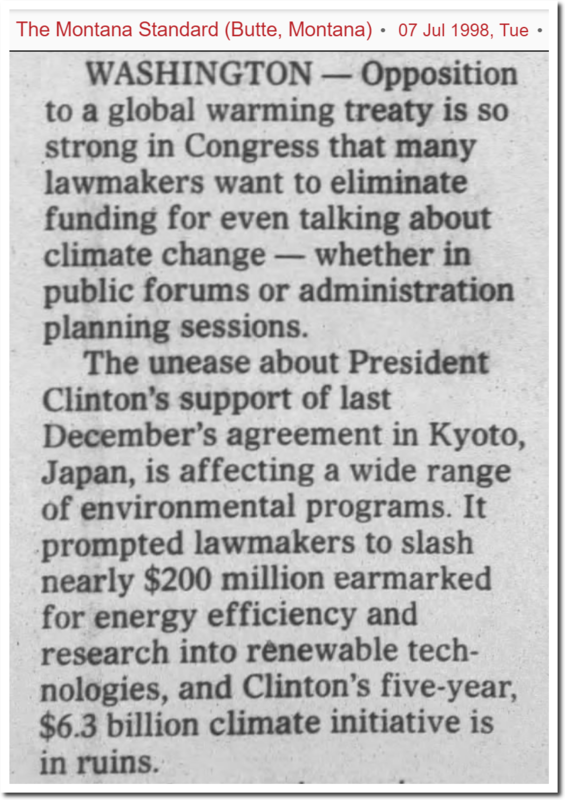 Nobody was “ready to act” – the Senate rejected Kyoto 95-0. Had NASA’s James Hansen been correct 30 years ago, lower Manhattan would be underwater now, and we wouldn’t have to be seeing the present stream of misinformation and lies coming from the fake news New York Times. And the Arctic would be ice-free now. It is fascinating how bold the New York Times is becoming about lying to the public however. Yet there is nothing new about this practice. It is up to the Independent Press (i.e. bloggers) to defend against climate cheats and liars – like the New York Times. It is wrong to mutilate or suppress the record of an observation of a phenomenon of nature, but it is also wrong to make a bad use of the record. 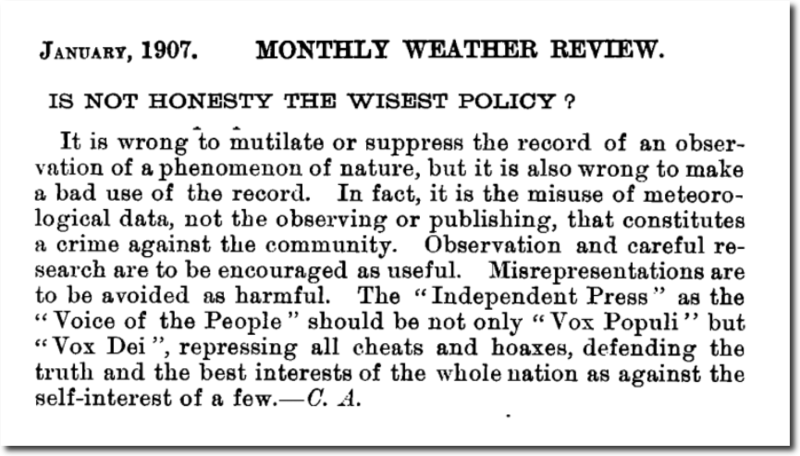 In fact, it is the misuse of meteorological data, not the observing or publishing, that constitutes a crime against the community. Observation and careful research are to be encouraged as useful. Misrepresentations are to be avoided as harmful. The “Independent Press” as the “Voice of the People” should be not only “Vox Populi” but “Vox Dei “, repressing all cheats and hoaxes, defending the truth and the best interests of the whole nation as against the self-interest of a few.